Over the past few weeks we have been updating our Joint Time Frequency Analysis (JTFA) tool for iTestSystem. In general, the JTFA tool is used to show how the frequency content of a signal changes over time. 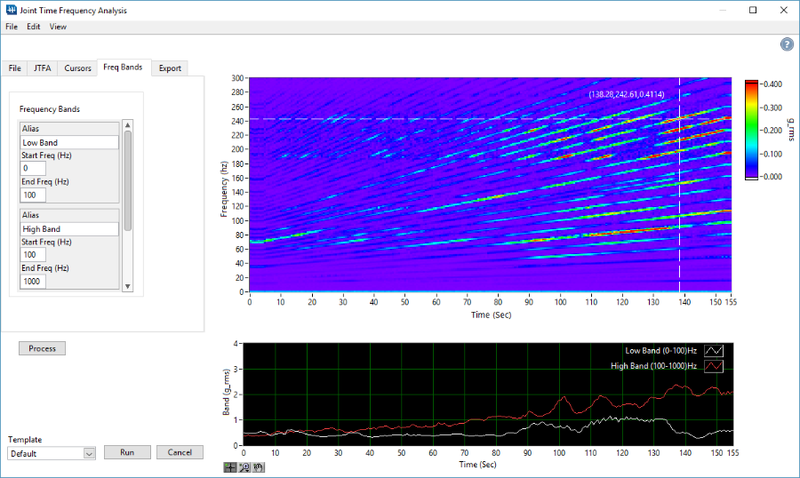 This tool is particularly useful for analyzing and visualizing vibration and strain data on rotating machinery. After using the JTFA tool on an internal data analysis project with a colleague, we realized that with a few additions and changes, the tool’s capabilities and processing efficiency could be greatly improved. To achieve this, we added a configurable overall frequency band algorithm for trending frequency bands related to specific machine fault or vibration modes. We also added templates for quickly developing and switching between frequency band signatures and settings. Finally, we added the capability to export the results to a data file for later viewing in TestView Plus or Excel. These changes are included in the latest version of the JTFA tool. For a free trial of iTestSystem and the JTFA tool, contact chase.petzinger@itestsystem.com.